Buck-a-Block for 2016 is ready! 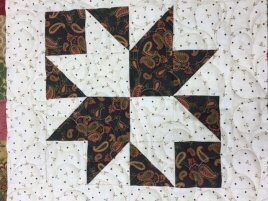 method of piecing half-square triangles, you need to! The pack costs $6 and has enough strips to complete the entire project. 4. Decide on a finish kit. We will have a finish kit for this project priced at $85. 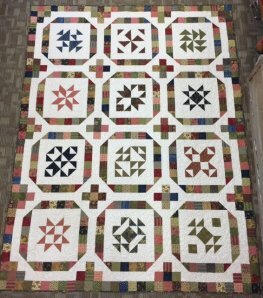 This will complete your 12 blocks into a quilt that is 76x100. The finish kit includes all the scrappy sashing, background and binding. These kits will be available on a first come-first serve basis, so let us know soon! 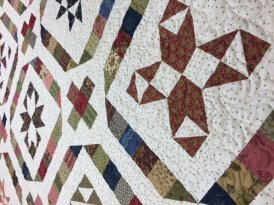 Traer, Iowa Saturday, January 30 A few other things to note: Our Return the Favor Charity Sew Day in Traer is January 30th. Click here to see more information. It's not too late to sign up for this year's Monthly Minis! Julie has designed a cute table runner for each month of the year. Get a full kit each month for just $28 including the pattern, backing and any buttons needed! SALE and DISCONTINUED ITEMS Have you checked out our SALE category on our website? We are discontinuing several Patch Abilities kits and patterns...so get them before they are gone forever! Merry's Stash Society Remember...every 3rd Thursday of the month: choose any 12 pre-cut fat quarters in the shop for just $25. Merry's Stash Society meets the last Thursday of each month at 10 AM or 1 PM. A free pattern and inspiration awaits each month! Be sure to check out our Facebook page for daily updates on what's going on in the shop!